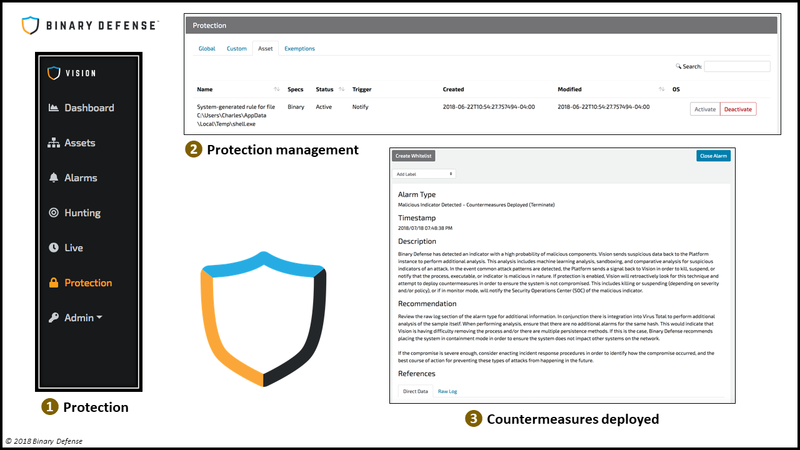 Binary Defense is pleased to announce the innovative release of our endpoint security platform Vision version 4.0 which introduces an array of new endpoint protection features to keep your data, your brand, and your people safe. Previously, Vision has been an outstanding endpoint detection and response tool (EDR) and a managed detection and response platform (MDR). Now, with this release, Vision incorporates an impressive number of additional protection features to keep systems and enterprises safe at no additional cost to our customers. This state-of-the-art Vision 4.0 release can replace traditional antivirus solutions and flaunts protection features that are superior to traditional endpoint protection products (EPP). For example, Binary Defense has just introduced a Vision protection component focused on post-exploitation analysis and identification of unusual behavior patterns that deploys countermeasures immediately to stop threats as they are happening. Anyone using traditional antivirus products can move to our fully managed Vision 4.0 Platform to reduce costs and improve their endpoint protection, detection, and response. Our managed detection and response (MDR) team is laser-focused on innovative identification and analysis of behavior and patterns—unlike traditional signature-based detection and prevention—which is how Binary Defense can identify attacks that went previously undetected. With the Vision 4.0 Platform we take another bold step toward proactively defending organizations in real time with direct protection and cloud analysis. Vision 4.0 adds power to your security response by identifying suspicious behaviors and also performing automatic analysis and investigation. Within seconds—that quickly—Vision can either prevent attacks from ever happening or analyze for risk factors and automatically execute countermeasures to terminate threats right in their tracks. Binary Defense is developing for the future and this is just phase one of several Binary Defense Vision innovations focused on protection technology. The Vision feature roadmap continues to grow—we have always acted as a market disruptor—and, as we add new technologies and methods for identifying and preventing threats in real time, expect many more protection benefits for your business to follow. We hope everyone is excited to learn about this new version 4.0 of the powerful Binary Defense Vision Platform. For current Vision customers this is an automatic software update and comes at no additional cost. Share with us how this release has improved your security or how Vision 4.0 Platform has found previously unidentified threats lurking on your endpoints. The Vision team would love to hear about your experience and how Vision keeps your data, your brand, and your people safe!